This brand-new two-story home can happily accommodate your large family with four bedrooms, while providing privacy, peace and quiet, and an amazing view. A truly secluded and serene luxury escape with all the comforts of home. 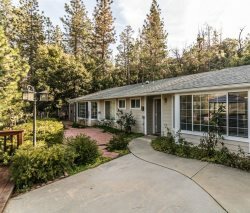 A perfect place to getaway Situation in the mountains of Oakhurst, the Suncrest Villa offers the convenience of nearby restaurants and shopping while only being only a short 40-45 minute drive to the South Entrance of Yosemite.